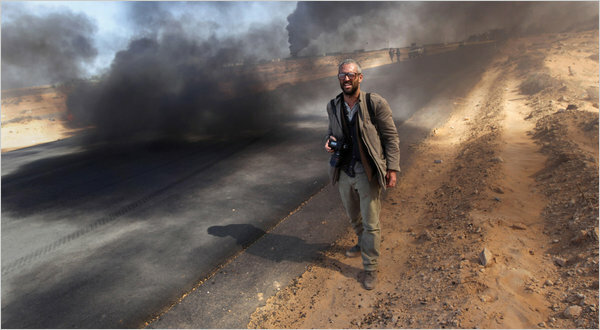 –Happily, the four talented, experienced journalists from the NYTimes captured by the Libyan government have been released. —Foreign news matters again inside big news organizations that have been hollowing out their “foreign desks” and closing overseas bureaus. –I’m not even sure what this story about Thrillist is all about, but it’s the most emailed business story, so here goes. I will admit that this is an activity I am not very good at, so I will not try. Instead, I take a more agnostic and empirical approach (more in keeping, I think, with the genius of journalism and history, which are essentially backward-looking enterprises). I am applying it now to the NY Times newly announced pay-for-news plan. To its credit, the paper has started covering the issue a bit better, including a piece today. Some of those people who are gifted with knowledge of the future are already weighing, as here. I say: let’s get some data first, then try to figure out what it means. Until then, I must say I wish the Times good luck in figuring this out. 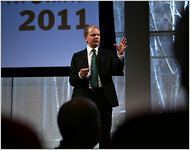 NYT publisher Arthur Sulzberger Jr. last week.